We offer DJ’s For Live Events, In-Store Events, Weddings, College Events, Parties, Mitzvah’s, and Pretty Much Any Other Event You Can Think Of! DJ’s are the most important part of the party and we make sure we only use the best! Our DJ’s are Nationwide, outgoing, ready to work with you on your event and make your special day run as smooth as you dreamed it would be! Do you DJ’s come to my town? We are a national talent agency with professional DJ’s located in every area of the country. We have over 20 years of experience making clients from NYC to Hawaii happy! What types of parties are your DJ’s experienced with? We book DJ’s regularly for big national corporate events for well known clients such as Nordstrom as well as small family celebrations like Bar/Bat Mitzvahs and Communions. No matter what the guest list size or demographic, we have a DJ for you! We’re having a big event, do your DJ’s have lights, props and all that fancy stuff? We can get as elaborate as your want. We can offer upgraded DJ packages with dancers, lighting effects and video screens. My party is pretty low key, can I just get a simple set up within my budget? Yes, we can accomodate most budgets with a fun, professional and experience DJ! Can we give input as to what’s played? 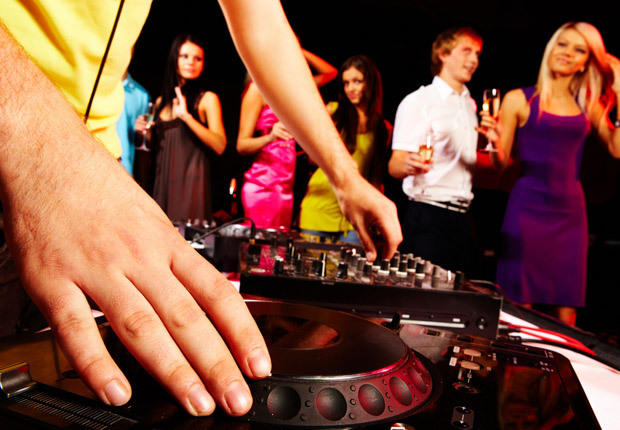 Our DJ’s will accomodate many such requests along with mixing music to please your crowd. Do your DJ’s do games with the kids? How about prizes? We have DJ’s that are fantastic with kids and can office customized packages. So just be sure to tell us whatever needs your crowd has. Our DJ’s will have appropriate attire. Anything from formal tuxedo’s to upscale-casual. Let us know if there’s a theme or dress code.